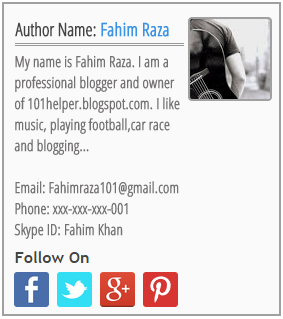 "About-me" gadget in blogger shows the profile pic, name and description about author of a blog. The simple about-me gadget shows only an image with a Google+ follow button and a link to Google+ profile. 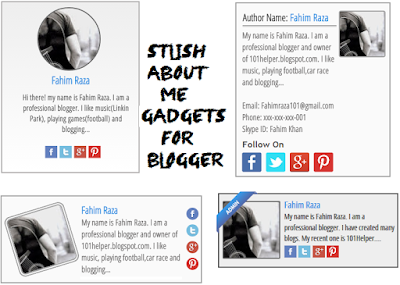 So I have created 4 stylish "about-me" gadgets which are easy to use, good looking and follow buttons of 4 different social networks are also added. I hope you like these gadgets. To add this gadget in your blog follow below steps. Replace http://lh5.googleusercontent.com/-p4_CJcGp4AM/AAAAAAAAAAI/AAAAAAAAABM/vdNgm0VFg70/s80-c/photo.jpg with your profile pic url. Replace Fahim Raza with your name. Maximum characters allowed are 12. Replace green colored text with your description. don't write too long description, otherwise it may look irregular. Replace the yellow colored links with your social profiles links. Hope you this post and this gadget is working fine in your blog. If you have any question about any of the above gadgets, ask me in comments or contact me. 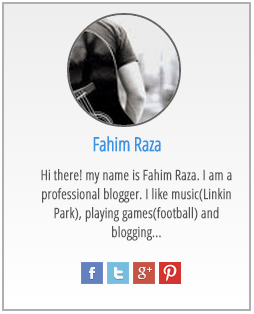 Follow and subscribe to get instant updates about blogger gadgets. Share this post with others and help my blog grow. Search Tags: "About me" gadgets with different styles for blogger, Stylish about me gadget for blogger, Author profile gadgets for blogger. What text? Sorry i didn't get you? Its a simple gadget you just need to make changes like your name. Style 3 is not working peoperly on my blog..
Whats the problem with style 3? The text part is lying outside the box.. Sorry for this.... thanks for informing.... i will soon fix it and email you please leave your email so that i can tell you about status. Re-install the gadget and make sure you don't have any other authorbox which is interupting this gadget. Add thia gadget in sidebar of your blog. Give me your blog link and email i will send you fixed code, this code is working on all my blogs, maybe your template has some code which is disturbing the alignment. I didn't find widget code on your blog so I can't fix it for you. Do you know css? if yes then simply make changes with css, without it you can't change layout.